Proper Bootstrap 3 support. Why? When I first migrated to Bootstrap 3, the Select2 box didn’t have the correct styles to support Bootstrap 3 so I found a work around. Now that there is better support, I’ve used the new Bootstrap 3 large style improve the Select2 input box. Added Submodules. Why? I don’t want to be responsible for maintaining gitignore.io’s list of templates as well as GitHub’s list of templates. 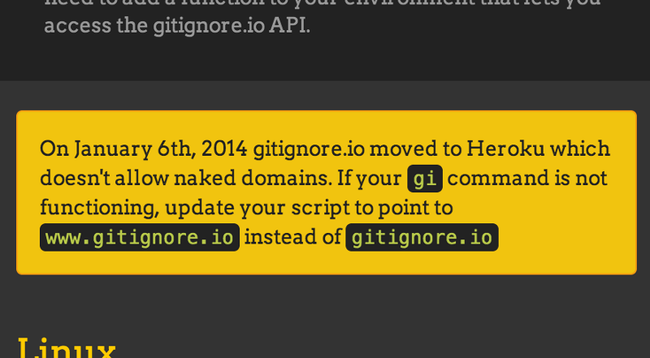 This submodule makes the process of keeping gitignore.io up to date simple. Migrated the application from Nodejitsu to Heroku. Why? Heorku’s submodule support is dead simple. After you push your branch to Heroku, it’s smart enough to pull all submodules before running the server. As a side note, my New Relic Apdex has been 1 a lot more after the migration. Migrated the domain from http://gitignore.io to http://www.gitngore.io. Why? Heroku doesn’t easily support naked domains. This change breaks the command line version of the application so existing users will have to update their scripts. In order to let older users know about the potential problem, I also added a warning to the command line page. Updated template list to now cover 171 Templates. Why? The goal for gitignore.io is to create an easy API to generate gitignore templates on or offline. This is my first year running a truly open source project, and the experience has been amazing. Thanks to all of the contributors who have made www.gitignore.io better along the way.